In 2019, the Thai National Holiday will take place from April 12-16. 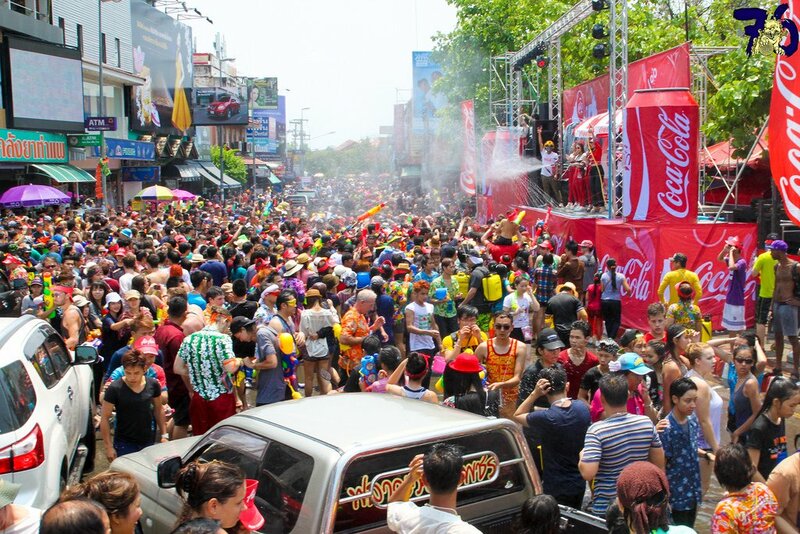 Songkran is the traditional Thai New Year and is very important to the religion and culture of the region. There are plenty of amazing festivities to accompany the traditions across the whole country. April 13th is typically the day most fun day and the 15th is the actual New Year’s Day with its own celebrations. If you happen to be in Thailand during this time be sure to read up and get prepared for a wild few days! This holiday holds a lot of significance for their religion and ancestry. Locals will spend time across the holiday visiting temples, leaving offerings, carrying out processions through the street with religious symbols, and visiting and honouring their ancestors. The national holiday has even been extended in recent years to allow families more time to travel and get together for the celebrations. Aside from honouring family and other obligations of the holiday, there is also a massive water fight! Did you say a water fight? Yes, yes I did. This holiday is often informally referenced as “the world’s biggest water fight”. This isn’t the way the holiday has always been celebrated, it has sort of transformed over more recent years into what it is today. Water has always been an important symbol for the holiday, representing the cleansing necessary to shift into the new year. 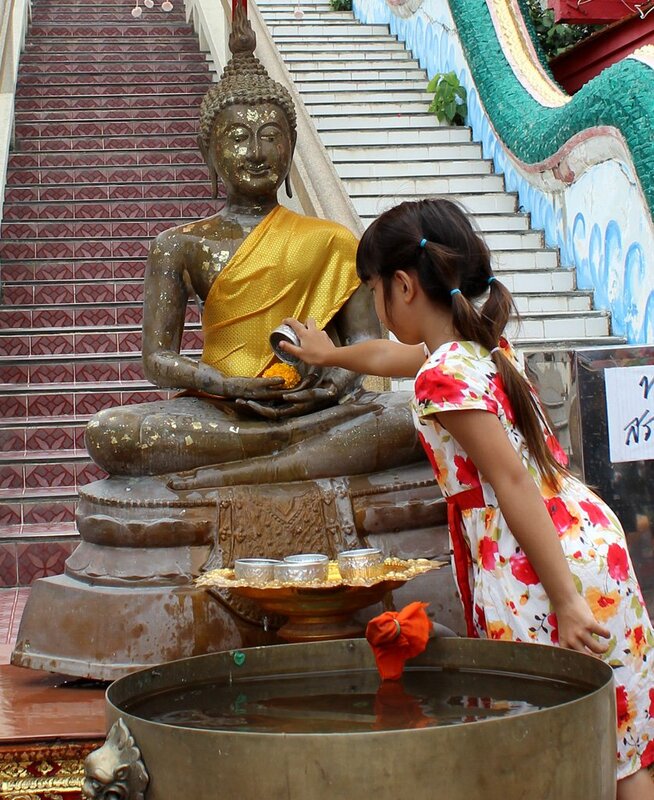 As this symbol of renewal, people would splash water on images of Buddha and elder people would have water splashed on them by their younger family members as a sign of respect. Today, however, the tradition has morphed into a much wilder scene. The streets are filled with people celebrating the festivities. Whether you’re eating, listening to music, watching live performances, enjoying carnival rides, or any number of the fun things to do at this time, no one is safe. 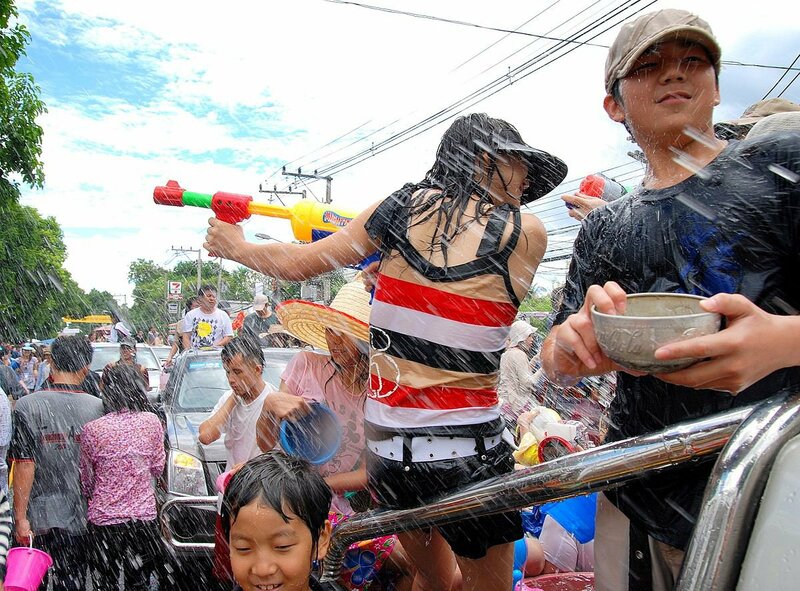 The streets are filled with people of all ages who are heavily armed with water guns and buckets of water. Anyone and everyone will get soaked, often unexpectedly from behind. In some areas, the water war lasts for the entirety of the holiday, while in some areas it is only one day where there is an all-out war. Besides the water fights, there is plenty of other attractions to see during the midst of the spraying. Street vendors will be selling everything from food to more ammunition (water) for your weapons. It is truly a sight to see and is unlike anything you’ve ever experienced before! 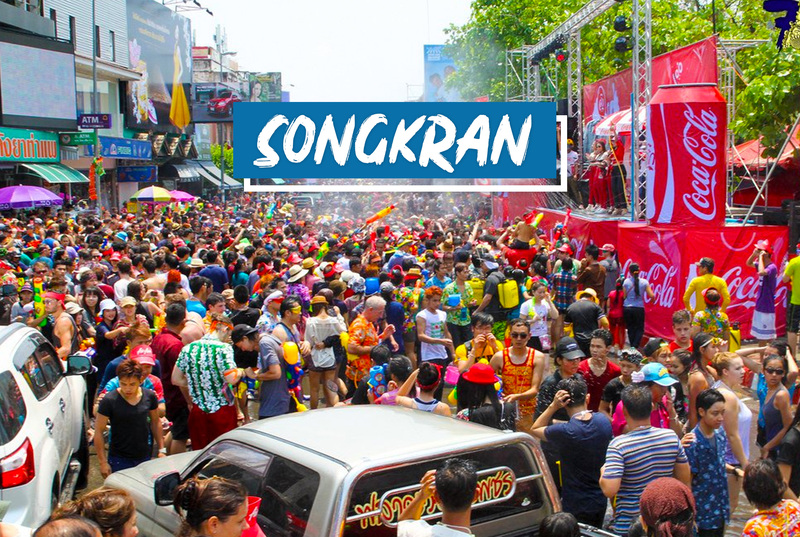 Although Songkran has so much meaning and importance to the local Thai people, tourists are always more than welcome to join in the celebration. Just be prepared to get soaked because you can’t avoid it so you must embrace it! If you want to enjoy the big and wild scene definitely go to any of the big cities like Bangkok, Chiang Mai, or Phuket. More tame experiences can be had, but not outside of your hotel or resort. As soon as you are in the streets, it’s fair game! If you are ready to take on this amazing holiday and get involved in the chaos, it is best to be prepared for it! Be sure to get stocked up on all the water guns and buckets you’ll need. It’s also a good idea to wear colourful clothes to fit in with the local attire of the festivities. Wear protective eyewear if you’re eyes are sensitive to water and if you’re hoping to bring a phone or camera make sure they’re waterproof or put them in a ziplock bag! Being in Thailand for Songkran is a wild experience. 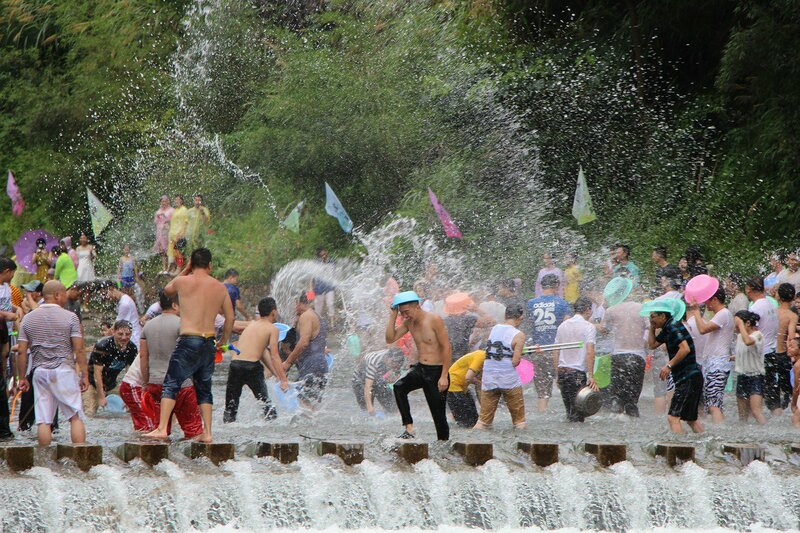 Whether you’ve already visited Thailand or not, Songkran is such a unique experience that you can’t find anywhere else. Check out a group tour to Thailand and plan your Songkran early!